Description Remove noise by applying a dip-field based, structurally aware filter. The Structurally-Oriented Filtering (SOF) process smooths along structural planes as defined by a dip field. It is an effective method of removing incoherent noise and improving continuity of events, without smoothing across dipping planes. This process requires a dip field to guide the smoothing operation (see Dip Field). In the Details Panel at Dip Volume, select the dip volume that will be used in the SOF process. 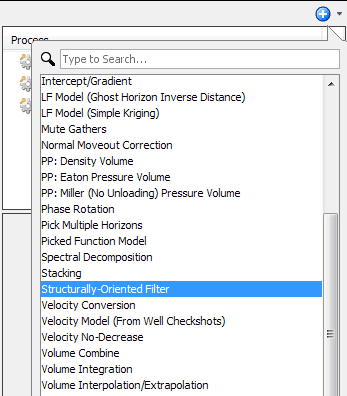 At Input Volume, select the volume that you want to apply the filter. 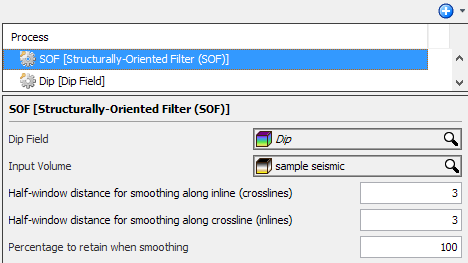 The fields to define more settings for SOF will be available. At Half-window distance for smoothing along inline (crosslines), type the value for the inline smoothing radius. A bigger value means more smoothing to be applied in this direction. Likewise, type the value for the crossline smoothing radius at Half-window distance for smoothing along crossline (inlines). If you have selected a gather volume at Input Volume, you can type the smoothing radius for the gather dimension at Half-window distance for smoothing across gather (m). At Percentage to retain when smoothing, type a percentage value to determine whether you want to apply the mean or median-mean smoothing in the process. By default, this is set at "100" which indicates the mean smoothing. The process will apply the median-mean smoothing at a percentage less than 100. 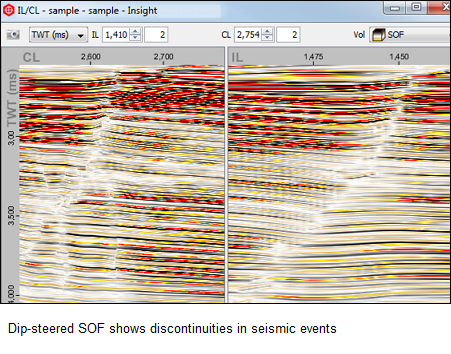 The SOF is essentially dip-aware smoothing. The parameters control the number of traces to be combined in the IL and CL directions. Read a 5 crosslines by 7 inlines grid of samples around a given point, following the dip. Average those 35 samples together to get a new output sample for that location. Repeat for every sample in the volume. The larger the half-window distances, the more it will tend to emphasize large and strong events, and tend to remove short and stubby reflections and noise.